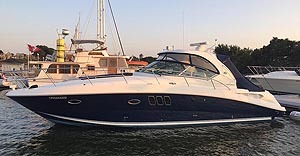 ONTARIO MARINE BROKERS - POWER BOAT, SAILBOATS, YACHTS, LIVEABOARDS, HOUSEBOATS FOR SALE IN WINDSOR, PORT DOVER, HAMILTON, SCARBOROUGH, PICKERING, WHITBY, COBOURG, TRENTON, BELLEVILLE, KINGSTON, Ottawa, CANADA. 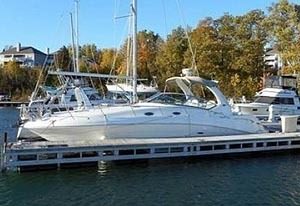 We List Express Cruisers, Houseboats, Motor Yachts & Sailboats For Sale By Boat Owners In Marinas. Simply Put ... We Sell Boats For Boat Owners That Don't Have The Time Or Desire To Sell Their Boat. 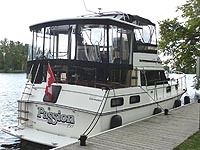 1984 THREEBUOYS 43' HOUSEBOAT - SOLD - $49,900.00 CDN. Length: 43' Beam: 12' Trenton Ontario. This boat is equipped with the standard 4 cylinder Volvo engine and stern drive. The boat has been owned by it's current owner for over 15 years and as a retired diesel engine mechanic ... he has done lots of upgrades. This boat was originally registered and launched in 1991 and a 2018 survey is available upon inspection. None of the 3 pontoons has any sign of damage or repair. Length: 40' Beam: 14' Whitby Ontario. Twin rebuilt Detroit diesel engines, 8.0 Onan diesel generator, all electronics updated in the last 2 years. than any other you will find anywhere ... look closely at our photos! Length: 39' Beam: 12' 6" Hamilton Ontario. Indoor heated storage until April 15th, 2019. Only 340 fresh water hours, properly maintained and updated as needed. Everything works, no disappointments or surprises. Quality late model trades considered. Viewings available by appointment 7 days a week ... sold between December 26th and 31st. View more photos and details on the listing. Length: 39' Beam: 13' 2" Trenton Ontario. Looking for the right boat for extended voyages ... or doing "The Loop"? Twin Cummins 5.9 turbo diesel power, a/c, generator, windlass ... and lots more. Shows a 10+. Viewings on-the-hard by appointment only after April 24th ... call Murray@613-227-2628. Length: 36' 7" Beam: 12' 9" Kingston Ontario. have always been a sought-after cruiser ... in part because of the view and amount of seating on the flybridge! 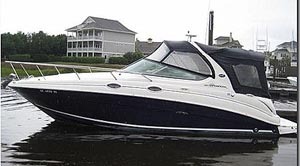 The boat sold to one of the buyers that we sent the listing to without putting it here on our homepage. Many of our boats sell that way every year. Sold in 9 days. Length: 36' Beam: 13' Cobourg Ontario. we'll have a new listing available. For now you can see the photos from our previous listing. Length: 34' Beam: 11' 8" Kingston Ontario. 450 hours ... twin 6.2 Mercruisers ... 3 year old top & windows, loaded. Sold to one of many Sea Ray buyers that contacted us since last fall using the form below. Length: 34' Beam: 11' 5" Whitby Ontario. 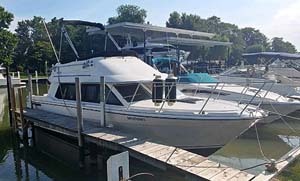 Twin 6.2 Mercruiser engines, Ac/Heat, genny, radar, windlass, cockpit ice maker/freezer, spotlight, GPS, VHF, TV, stereo, cockpit top with windows, hydraulic engine cover, screens and privacy panels. This boat owner covers all cockpit upholstery when he leaves the boat ... so it is in "like new" condition. Length: 33' Beam: 11' 6" Hamilton Ontario. Twin 5.7 Mercs with Bravo 3 stern drives ... tan top ... loaded ... showed a 10+ last fall when we discussed listing it. Viewings on-the-hard by appointment only after May 1st ... call Murray@613-227-2628. We cannot get photos until May 1st. Length: 32' Beam: 9' 1" Trenton Ontario. This boat has about 234 hours on it. It has the 6.2 Mercruiser engine with a Bravo 3 duoprop stern drive, air conditioning/heat, windlass, spotlight, a 2nd fridge/freezer in cockpit area, on-shore water, 2 shore power electrical hookups, stereo with remote controls ... and lots of standard features. This is a freshwater boat that was sold new locally. Length: 32' Beam: 11' 5" Trenton Ontario. The Carver 3207 & 3607 Aft Cabins have been very popular and sought after models for many years. This boat was surveyed in the summer of 2018. The 11' 5" beam creates a roomy double-cabin, generous salon dimensions, a roomy galley (with an upright refrigerator no less), two heads (one with a separate stall shower), and a terrific sized aft cabin and a "Genco" winter cover is included. Length: 31' Beam: 9' 5" Trenton Ontario. Twin Mercruiser 4.3's with Bravo 3s, Air/heat and more. This is a nice, clean tidy fresh water boat that is stored inside and priced to be sold before spring. It sold to a buyer watching for this model before we could complete the listing! Length: 30' 6" Beam: 9' 10'' Windsor Ontario. our 1995 is priced VERY right! Length: 27' (32' LOA) Beam: 10' Trenton Ontario. New listing April 3rd ... Available for showings April 3rd. Twin Mercruiser 5.0's with about 300 hours on the engines and stern drives. This boat was stored indoors for over 20 years ... the stern drives were rebuilt spring 2018, new top, windows and screens mid-summer 2018, new barbeque and mount mid summer 2018 .... and it has a great survey from April 2018! Mechanical work done at Crates Belleville ... invoices available. Length: 26' Beam: 9' Kingston Ontario. buying motorhome ... more photos about May 1st. Length: 24' 6" Beam: 8' Trenton Ontario. depth sounder, GPS, all safety gear and 3 sails. 80 year old owner retiring from boating. 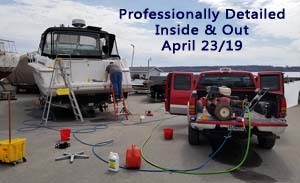 email us a photo of the boat when it is unwrapped for spring buyers to consider. THE BOATS SOLD IN 2018. Proud buyers want to show their friends and family the boat they bought ... so we have left them on our website until May of 2019. "New Buyers" can also see the sizes, layouts, colours and other details that may help them decide on the boat "brand" or "model" that they would like to buy. 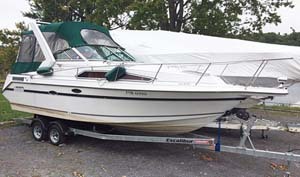 1988 CARVER 3867 SANTEGO - SOLD - $39,900.00 CDN. 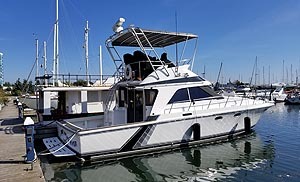 This boat can be a terrific liveaboard or family cruiser. The boat is loaded with air/heat, generator, radar, gps, vhf, windlass and more. The top and windows are just 2 years old and look like new. The 7.4 Blue Water engines have just 970 hours on them and the boat is being sold by a couple that are retiring from boating. Note: 14 foot beam ... about 900 hours ... Freshwater boat! Length: 43' 10" Beam: 13' 10"
The boat is equipped with an 8 KW genset, it sleeps 7 +, has a 2011 10ft RIB c/w 15HP Merc. motor included with the sale, Ipad 2 navigation, very good condition, just 650 hrs, lots of room, 2 state rooms ... aft with head and seperate shower stall ... forward with head and shower, leather couch, new microwave, new windows, new wicker deck furniture. The galley area maple flooring was new last year as were the windows in the black top. This houseboat is similar to the Holiday Mansions. It has a full aluminum hull. It is very clean inside and out and her many large windows provide terrific breezes. There is a full size fridge, stove with oven and a full size BBQ. The head has a shower and a bathtub. You are able to walk around the entire exterior of the boat with ease. There are a total of 4 outdoor patio spaces and the upper helm and front seating areas are covered. The twin 318 Chryslers have been rebuilt and run great. Twin 7.4 Crusader engines, all canvas, windows and screens were replaced in the spring of 2017, her 14' beam offers a huge salon area, she has recent upgrades in the salon, galley, both heads (seperate show stalls in each), the cockpit and other areas. Length: 39' 5" Beam: 12' 4"
This boat is loaded and has several really nice upgrades. The boat is stored indoors at a marina that will not open until after April 15th at which time the shrinkwrap will be removed and the top and windows put back up. The photos on our listing have been supplied by the seller. Length: 39' Beam: 12' 6"
A FRESHWATER BOAT - SISTERSHIP SHOWN. Indoors and heated for easy viewing seven days a week. Sellers are moving up and this boat is aggressively priced to sell now. Please note that there are just 340 hours on the merc 8.1’s! Twin Mercruiser 7.4 engines with Mercruiser Bravo 2 stern drives and about 600 hours. Ac/heat, genny, windlass, radar, GPS, VHF, central vac, cockpit fridge/freezer, spotlight, roomy midcabin. A VERY clean boat. Look closely at the photos! Sold in 5 days! The Maxum 3300 SCR indulges passengers with amenities, spaciousness, performance and prestige rivaling many yachts. For the seasoned elite wishing to graduate to the next level of luxury while putting exotic ports of call within reach, here's the passport. The elegantly ergonomic helm features a full array of analog instrumentation, an illuminated compass, a depth indicator, and a VHF radio for confidently navigating to far-off destinations. The 3300 SCR's richly appointed, Euro-designed salon encourages civilized entertaining in any port. Length: 33' Beam: 10' 6" Trenton Ontario. JUST 138 Hours on her twin 5.0 engines and duoprop stern drives. The boat is equipped with Ac/Heat, Windlass, SideShifter Bow Thruster, tv, a built in cockpit blender, cockpit fridge, fenders, lines, power cord ... and as clean as any 2015 model!! The senior owners are retiring from boating. Length: 32' Beam: 11' Trenton Ontario. Twin economical 5.0 Mercruiser engines, just about 770 hours, immaculate condition & certainly one of the cleanest late-90's aft cabin cruisers of it's size for sale for under $50,000.00 ... and she has all the popular options boaters want including ac/heat, genny and a queen size aft cabin! Length: 32' Beam: 11' 5"
The fact that the Carver 32 Aft Cabin managed to remain in production for so many years says a lot about her popularity with the public. A roomy double-cabin interior with surprisingly comfortable cruising accommodations. Generous salon dimensions, a roomy galley (with an upright refrigerator no less), two heads (one with a separate stall shower), and two economical staterooms. 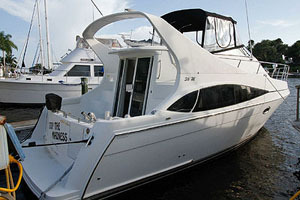 This boat has A/C ... a $4,000.00 winter cover from Genco ... and the seller is motivated! Length: 32' Beam: 12' 4"
A very popular Carver model due to it's generous beam, flat cabin floor from the patio door cabin entrance to the front berth and seating for 10 in the upper helm area. This boat has just 660 hours on her twin 5.7 Mercruiser engines, factory air conditioning, a new top & windows, new upholstery at the helm, new sunpad on the bow and 2 recovered couches ... all added last spring ... over $8,000.00 worth of upgrades just last year. The boat has twin V8 engines with less than 1,000 hours on them. It has lots of upgrades and is being sold so the currento owners can move up. 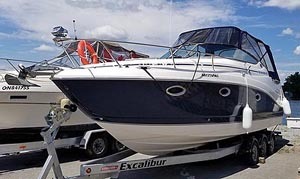 This boat is in excellent condition, was detailed the first week of June and for this very fair price, the hours, the condition and the size of the boat ... it will sell quickly. Length: 31' 11" Beam: 10' 4"
Equipped with twin 4.3 V6 engines this is an economical family cruiser. The rear cockpit size is large and easily seats 6 adults, the cabin sleeps 4 and an additional 2 persons can easily sleep in the aft cabin which has a privacy door and is nicely outfitted for their clothes and things in cupboards and drawers ... the galley is amazingly large for the size of boat and has lots of storage. This boat shows a 10+! The owner of this boat has relocated and cannot use the boat where he is now. This boat is owned by a very experienced boater that has a marine mechanic as a very close long-time friend. 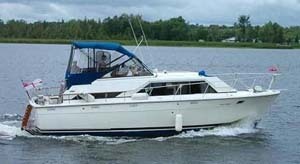 The boat is clean, has about 1,400 hours on her twin 5.7 Mercruisers, the top, windows, upholstery, cabinetry and flooring is in terrific condition. The boat shows a 10+. Length: 31' Beam: 10' 7"
Just 330 hours ... Comforts include air conditioning and heat, built-in TV, Clarion Marine sound system, stainless steel aft-mounted BBQ, new Bimini top and tanning bed. The cabin sleeps six, galley is equipped with 2 burner stove - gas or electric option, built-in microwave and fridge (second fridge in cockpit). Fitted/removable beige carpet below and beige Berber carpet above. This is the most popular cruiser ever built by Doral. 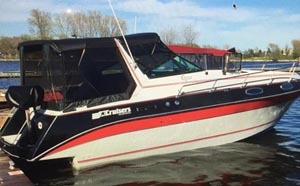 Twin 4.3 Mercruiser V6's, upgraded upholstery in cockpit and cabin, massive extended swim platform, transom hot/cold washdown, powerful upgraded stereo system, electronics, 2 year old top and windows. Length: 29' Beam: 8' 6"
Twin 7.4 Mercruisers, 260 hours, Bravo One Drives, Mirage SS Props w/ Extra pr. 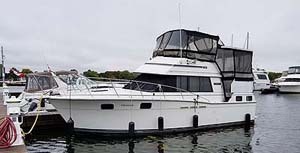 Kept on Lift during season, Heated inside Storage off season.Inside the cabin, will comfortably sleep 2 in the V-Birth and 1 along the Port side couch. Removeable cockpit carpet, underfloor storage and matching custom tri-axle trailer. 3 Cover pkg. including full mooring, bimini with clear camper complete and tonneau cover. Length: 28' Beam: 9' 6"
Freshwater boat with a rebuilt 7.4 Mercruiser and re-upholstered cabin interior. We'll have more photos and description details on our full listing when the boat has it's shrink wrap removed and the top is back up. The boat sold before we could get the photos! 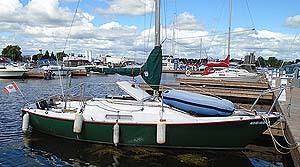 Length: 28' Beam: 11' 1"
The Carver 2827 was built between 1985 and 1990 and called "Voyager" and later "Mariner". 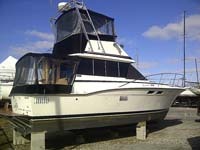 They were a terrific seller offering an 11' 1" beam and a spacious upper helm. They have the same hull as the "Mariner" models of the same era ... and all 3 versions were extremely popular. Length: 27' Beam: 8' 6"
Listed August 12th ... Sold August 14th. Sold in less than 2 days! This boat has about 900 hours on its 7.4 Mercruiser engine and stern drive. 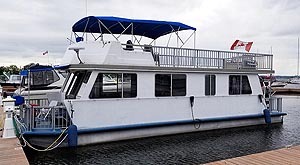 The boat is somewhat unique in that it has factory air conditioning (very hard to find in a 27' aft cabin cruiser) and the lounger seat opposite the helm seat. The boat is very clean and the slip at Trent Port Marina is included for the rest of the season. Length: 25' Beam: 7' 2"
This is perhaps the most unique sailboat you will find for sale this year. The boat is equipped with a Yamaha 9.9 motor with electric start! If you would like us to list your boat with our large clear photos ... List Your Boat With Us! Length: 51' 4 " Beam: 14' 8"
Length: 35' Beam: 11' 3"
Length: 38' Beam: 13' 10"
Length: 26' 9" Beam: 9' 8"
Length: 30' Beam 10' 6"
Length: 38' Beam: 13' 2"
Length: 35' Beam 11' 6"
Length: 26 2" Beam 8' 8"
Length: 28' 10" Beam: 8' 6"
Length: 33' Beam 11' 6"
Length: 27' Beam: 9' 1"
Length: 39' Beam: 13' 2"
Length: 26' 1" Beam 9' 6"
Length: 33' Beam 10' 9"
Length: 33' Beam 11' 5"
Length: 25' Beam 8' 6"
Length: 43' 10" Beam 13' 10"
Length: 46' 11" Beam 14' 11"
Length: 33' Beam 8' 6"
Length: 24' 6" Beam: 8' 6"
Length: 31' 10" Beam 10' 4"
Length: 33' Beam: 11' 6"
Length: 32' Beam 11' 2"
Length: 32' 1" Beam 11' 6"
Length: 27' 1" Beam 9' 6"
Length: 32' Beam 11' 7"
Length: 32' Beam 11' 6"
Length: 35' Beam 12' 6"
Length: 34' Beam 11' 11"
Length: 34' Beam 12' 6"
Length: 41' 3" Beam 13' 10"
Length: 39' Beam 13' 3"
Length: 40' Beam 12' 8"
Length: 34' Beam 11' 6"
Length: 33' Beam 11' 11"
Length: 36' 7" Beam 12' 6"
Length: 35' Beam 13' 2"
Length: 26' Beam 8' 6"
Length: 26' 6" Beam 9' 6"
Length: 26' 7" Beam 8' 6"
Length: 27' Beam 8' 6"
Length: 28' 10" Beam 10' 3"
You Can Also View All Of Our Listings Easily On Your Cellphone Or Tablet. We Have More Listings Coming Soon ... So Check Our Website Often! Every broker will tell you that most used boats sell on weekdays ... not weekends. List Your Boat With Us ... and we can show it while you are busy at work or with your family! Hamilton, Whitby, Cobourg, Trenton, Belleville, Kingston, Ottawa, Smith Falls, Cornwall, Ontario, Canada.